ACORE is pumping out the PR now that Congress is poised to either let die or renew a provision created by the staff of the U.S. House of Representatives Ways & Means Committee in January 2009. The provision being considered in the pending tax bill will potentially support or inhibit renewable energy projects in 2011. It appears California, Arizona, and Wyoming stand to gain the most based on an analysis prepared by the US Partnership For Renewable Energy Finance (US PREF)..
December 14, 2010 – Washington, DC: The US Partnership For Renewable Energy Finance (US PREF) introduced an analysis that a provision being considered in the pending tax bill stands to save at least $25 billion of renewable energy projects in 17 states in 2011, among which California, Arizona, and Wyoming stand to gain the most. The issue is a technical change in earlier law about tax credits for renewable energy projects, allowing project owners to opt instead for a cash grant. This provision was created by the staff of the U.S. House of Representatives Ways & Means Committee in January 2009, in the depths of the financial crisis, as a way of keeping the development of renewable energy projects going in the country. It gives the U.S. industry and entrepreneurs flexibility in using the long-standing production and investment tax credits (PTC/ITC). This approach worked. This innovative provision proved to be “good public policy” but it expires on December 31, 2010. The question remains as to whether or not Congress will extend this provision in light of the fact that the financial crisis is continuing in many sectors of the economy. The PTC/ITC programs were first enacted in 1992, and have been modified and enhanced on a bipartisan basis. As a result of the recent recession and associated financial crisis, the tax equity market for these credits was reduced by as much as 67% from recent market levels and is expected to remain well below these levels for the next two years. The technical change in 2009 provided important market flexibility producing a huge expansion in U.S. renewable energy investment and generation. US PREF has been leading an educational campaign since May 2010 about the effectiveness of this Treasury Grant Program (TPG), arguing that it is the most important provision in recent times. 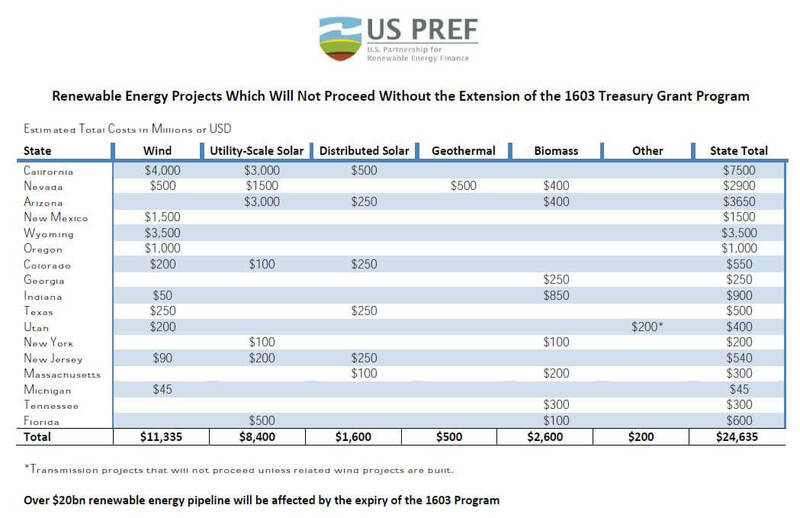 US PREF is a program of the American Council On Renewable Energy (ACORE), a 501(c)(3) non-profit organization. The objective of the US Partnership for Renewable Energy Finance (US PREF) is to unlock capital flows to new, large-scale and distributed renewable energy projects in the United States. To achieve this objective, a balanced and credible group of highly experienced renewable energy financiers from financial institutions, investors, professional services firms, utilities and others, working with leading non-government organizations, have convened as US PREF. US PREF members include Bank of America Merrill Lynch, Citi, Credit Suisse, Deutsche Bank, First Solar, Greentech Capital Advisors, GE Energy Financial Services, Google, Green Order, Hudson Clean Energy Partners, Madison Dearborn Partners, Morgan Stanley, NRG Energy, Skadden Arps, SolarCity, Starwood Energy, Troutman Sanders LLP, US Renewables Group and VantagePoint Venture Partners. To view all US PREF white papers and analyses, visit www.uspref.org. The American Council On Renewable Energy (ACORE), a 501(c)(3) membership non-profit organization headquartered in Washington, DC, is dedicated to bringing renewable energy into the mainstream of the U.S. economy and lifestyle through research and communications programs and membership committees. ACORE’s membership works in all sectors of the renewable energy industries including wind power, solar energy, geothermal energy, hydropower, ocean energy, biomass, biofuels, and waste energy. ACORE provides a common platform for the wide range of interests in the renewable energy community including end users, technology companies, manufacturers, utilities, professional service firms, financial institutions, colleges and universities, associations, non-profit organizations and government agencies. ACORE serves as a thought leadership forum through which these parties work together on common interests. ACORE co-organizes the REFF-Wall Street and REFF-West Finance Conferences, the RETECH All-Renewables Energy Conference and Exhibition, the Phase II National Policy Forum in Washington, DC, and hosts both domestic and global policy events furthering the mission of renewable energy. Additional information is available at www.acore.org. Washington, D.C. – December 14, 2010 – At the 7th annual Phase II Policy Forum, the American Council On Renewable Energy (ACORE) found optimism for the upcoming 112th Congress, asserting that both political parties want the economic growth and jobs provided by wind power, solar energy, hydropower, geothermal energy, biomass energy and fuels. At ACORE’s Phase II Policy Forum held on Capitol Hill, Michael Eckhart, President of ACORE, explained that the balance of power for the upcoming 112th Congress, where the House of Representatives and the White House are held by different parties and the Senate has a near equal split between Republicans and Democrats, is the pattern that has historically been the most productive in terms of generating legislation. “This summit has set the table for a productive legislative session and has already shown results for bi-partisan cooperation as well as forging new cross-industry collaboration,” Eckhart said. The Phase II Policy Forum laid the groundwork for a new, bi-partisan renewable energy policy platform of commitment, innovation, finance and education. Featuring industry and financial experts in addition to key lawmakers representing both the conservative and liberal agendas, the Forum presented an opportunity to find common ground on the critical issues facing renewable energy: jobs and economic development, national security, and the environment and climate. Four major developments were announced at the Forum. The first came from U.S. Representative Chris Van Hollen (D-MD) who declared in the Forum’s afternoon session that it looked like Republican leadership was going to include a successful policy adjustment (known as the 1603 cash grant in lieu of tax credits) into the Tax Extenders Bill. ACORE and its program, the US Partnership for Renewable Energy Finance (US PREF), have urged Congress to extend the 1603 cash grant program because of its positive impact on American jobs and businesses. “We are specifically calling on the U.S. government to extend the U.S. Treasury grant renewable energy program, which has played an important role in financing renewable energy projects during the past two years,” said Kevin Walsh, managing director and leader of power and renewable energy at GE Energy Financial Services. In a second announcement, Eckhart announced a strategic alliance between ACORE and the Natural Gas Supply Association (NGSA) proposing that energy regulators adjust their rules to allow natural gas power plants and renewable energy projects to participate jointly in electricity markets. FERC Chairman Jon Wellinghoff indicated support for the concept, indicating that there is potential to further the deployment of utility scale renewable energy by partnering those projects with natural gas combined cycle plants. In addition, Chairman Wellinghoff expressed interest in assessing the feasibility of the Renewable Energy Standard Offer (RESO) proposal put forward by ACORE. Also in the renewable fuels arena, Jeff Broin, President of the large ethanol producer, POET, called for a redirection of the ethanol tax credit to fund distribution infrastructure, and for all vehicles sold in the U.S. to have more flex fuel capability. Other Phase II speakers included: Dan Arvizu, Director, National Renewable Energy Laboratory (NREL); Jeff Broin, President, POET; McKie Campbell, Republican Staff Director, Committee on Energy and Natural Resources, United States Senate; U.S. Representative Bob Inglis (R-SC); Gary Locke, U.S. Secretary of Commerce, U.S. Department of Commerce; Arun Majumdar, Director, ARPA-E, U.S. Department of Energy; Dan Reicher, Executive Director, Steyer-Taylor Center for Energy Policy and Finance, Stanford University; Bob Simon, Staff Director, Committee on Energy and Natural Resources, United States Senate; U.S. Senator John Thune (R-SD); and Ethan Zindler, Bloomberg New Energy Finance.